It is 9 in the morning here at our resort situated in the Mudumalai forests at the foothills of the Nilgiri mountains near Masinagudi. It is a misty morning with low visibility, however, I have set out as usual, with a camera in my hand. 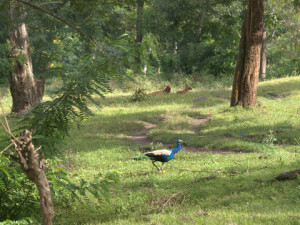 Suddenly I hear a loud alarm call from peacock as they flutter to the nearest tree with a heavy flapping of their wings. 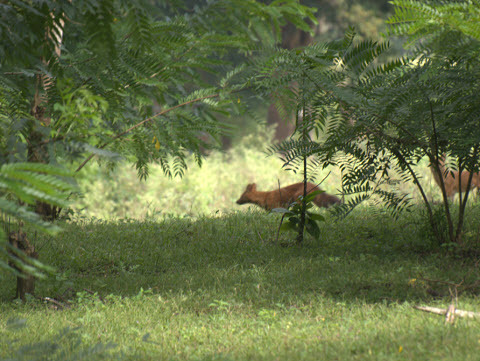 Langurs sent out an alarm call for the deer grazing about a hundred meters away in the open grassland. 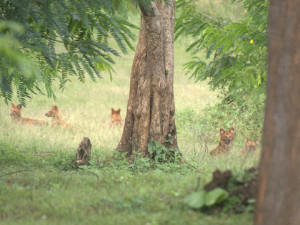 I thought it must be our “resident” leopard on prowl, but I was wrong it was a pack of Wild dogs. I watched as the dogs skillfully move in synchronization. 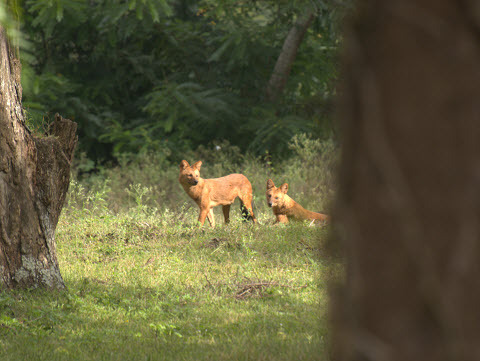 They usually are a large pack of 15 but today only 7 are seen. While the langurs ensured the deer anticipated an attack by the wild dogs; the dogs came toward the open track and then split into three groups, moving stealthily on either side of the herd of deer. The deer gave out alarm calls to one another and split into two groups keeping a close watch on the moves of their predators on either side of their herd. The leader in the herd suddenly dashed towards the lake in to the forest and was followed by atleast three hundred deer. We just ran into your blog article during our wild surfing escapades on the internet. Thank you for providing great details of your experience at our wildlife resort at Masinagudi. We were so very happy to read it. Hope all if well with you.